Intelsat EpicNG’s fast and efficient broadband connectivity now available across 5 continents, serving enterprise, wireless telecommunications, mobility, government and Internet of Things applications. Expands Intelsat EpicNG coverage for aeronautical and maritime mobility, from the Caribbean and North Atlantic across Europe, Asia and Africa. 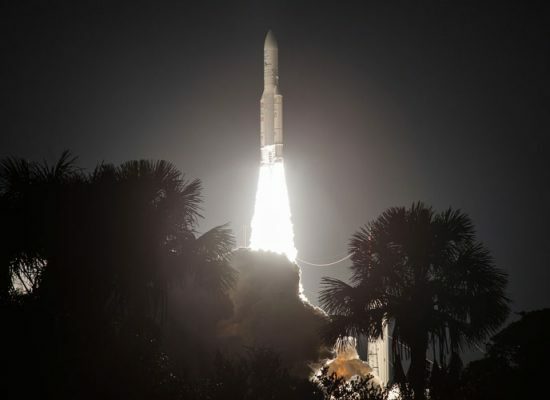 Intelsat S.A. (NYSE: I), operator of the world’s first Globalized Network, powered by its leading satellite backbone, today announced that Intelsat 33e, the second of seven planned Intelsat EpicNG high throughput satellites, was launched successfully from French Guiana aboard an Ariane 5 launch vehicle. Liftoff occurred at 6:16 p.m. EDT. The Intelsat 33e satellite separated from the rocket’s upper stage at 6:44 p.m. EDT, and signal acquisition has been confirmed. Intelsat 33e, manufactured by Boeing, will bring high throughput capacity in both C- and Ku-band to the Africa, Europe, Middle East and Asia regions from 60°E. The satellite will join Intelsat 29e, the first Intelsat EpicNG satellite, which was launched in January 2016 over the Americas and North Atlantic Ocean region, to form a high throughput overlay to Intelsat’s fleet of enterprise-grade, wide beam satellites. Intelsat 33e is equipped with the sector’s most advanced digital payload on a commercial spacecraft and combines wide beams and spot beams with frequency reuse technology. The digital payload provides customers with unprecedented security and flexibility, enabling seamless access and the ability to shift capacity to match their usage needs in a particular region or timeframe. Intelsat EpicNG is optimized to provide satellite connectivity for applications including the Internet of Things, enterprise, wireless infrastructure, aeronautical and maritime mobility and government, which are expected to provide a combined $3.3 billion incremental industry-wide revenue opportunity between 2015-2021. The Intelsat 33e payload will deliver carrier-grade services to fixed and mobile network operators, and broadband for applications such as enterprise, aeronautical and maritime mobility, and government. Companies such as EMC, Gogo, Harris CapRock, KVH, Marlink, Panasonic Avionics, Romantis, Supernet, and Television and Radio Broadcasting Network of Armenia (TRBNA), will be among the first to deploy services on the platform. Intelsat 33e is the 57th Intelsat satellite launched by Arianespace. It will replace Intelsat 904, which will be redeployed.